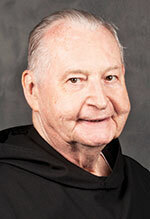 Benedictine Father Columba Kelly, a monk of Saint Meinrad Archabbey in St. Meinrad, died on June 9 in the monastery. He was 87. The Mass of Christian Burial was celebrated on June 13. Burial followed in the Archabbey Cemetery. Father Columba was a jubilarian of monastic profession, having celebrated 64 years of monastic profession. He was also a jubilarian of ordination, having celebrated 59 years of life and ministry as a priest. He is best known for being a pioneer in the renewal of liturgical music for decades following the Second Vatican Council. He adapted many Latin chants used before the council for use in English, and composed nearly 2,000 new responsories and antiphons. They continue to be used in worship at Saint Meinrad and in religious communities and parishes across the English-speaking world. His fellow monks at Saint Meinrad also valued Father Columba’s witness of faithfulness to liturgical prayer, even when his declining health in recent years made it difficult for him to get to the monastery’s church. John Joseph Kelly was born on Oct. 30, 1930, in Williamsburg, Iowa, and grew up as a member of St. Mary Parish in Lanesville. After attending St. Ambrose College in Davenport, Iowa, for a period, Father Columba enrolled at the former Saint Meinrad College in St. Meinrad. He was invested as a novice of Saint Meinrad Archabbey in 1952, professed simple vows on July 31, 1953, and solemn vows on August 6, 1956. Father Columba completed his priestly formation in Rome and was ordained a priest on July 5, 1958, in Maria Einsiedeln Abbey in Einsiedeln, Switzerland, Saint Meinrad’s motherhouse. He earned a licentiate in sacred theology at the Pontifical Athenaeum Sant’ Anselmo and a doctorate in Church music at the Pontifical Institute of Sacred Music, both in Rome. Father Columba returned to Saint Meinrad in 1964 at the time of the start of the implementation of the renewal of the liturgy approved by the Second Vatican Council. He was appointed the monastic community’s choirmaster, serving in that position for 14 years, and taught in both Saint Meinrad College and Saint Meinrad Seminary and School of Theology. He also taught for periods at the former St. Joseph College in Rensselaer, Ind., the University of California Los Angeles and the University of Wisconsin in Madison, Wis.
As the renewal of the liturgy began to be implemented in the mid-1960s, Father Columba’s task was to introduce the use of English in the Eucharist and in the praying of the Liturgy of the Hours. His studies in Rome had prepared him well to adapt the original Latin chant for use in English. Father Columba also composed many new chants on his own—nearly 2,000 responsories and antiphons. Collections of his antiphons published by GIA Publications and Oregon Catholic Press continue to be used in parishes and religious communities across the English-speaking world. Father Columba also directed chant scholas of Saint Meinrad that recorded CDs of chant for Advent, Christmas, Lent and Easter. Charles Gardner studied briefly under Father Columba at Saint Meinrad and appreciated his work in renewing liturgical music after Vatican II, which was helpful in his own ministry in the archdiocese for 40 years. For many of these years, Gardner served as executive director of the archdiocesan Secretariat for Spiritual Life and Worship. “He was always unfailingly optimistic and hopeful,” said Gardner of Father Columba. Many others learned the principles of chant from Father Columba in two‑week workshops he held each summer at Saint Meinrad for decades. After retiring from serving as a full-time member of Saint Meinrad’s faculty, Father Columba continued to offer as an adjunct faculty member independent studies and specialized courses to seminarians and theological graduate students. Father Columba also wrote or contributed to several books on liturgical music and was a member of several liturgical music associations. In 2015, the Liturgical Institute of the University of St. Mary of the Lake in Mundelein, Ill., awarded Father Columba its Spiritus Liturgiae Award. In addition to serving his community and the broader Church in the renewal of liturgical music, Father Columba served Saint Meinrad as its prior, the second in authority in the monastery, from 1978-84. He also spent many years as a commuting chaplain for Monastery Immaculate Conception in Ferdinand, Ind., in the Evansville Diocese.